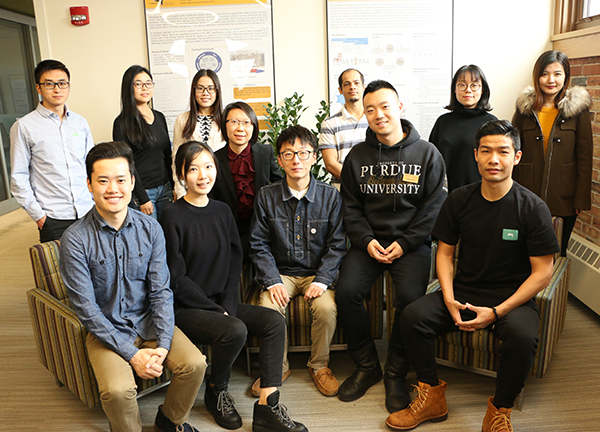 Assistant Professor Hua Cai and her research group (pictured left) are using agent-based modeling, optimization, life cycle assessments, system dynamics, big data analytics, and GIS to study the environmental implications of emerging technologies from the systems perspective. Dr. Cai’s research interests include energy-water nexus, emerging transportation systems, urban sustainability, and sustainable consumption. One of her areas of research is on the environmental impacts of emerging transportation systems such as dynamic ride sharing enabled by smartphone apps, electric vehicles, multi-modal transportation, bike sharing, and autonomous vehicles. Pictured left: Dr. Hua Cai and her research group. 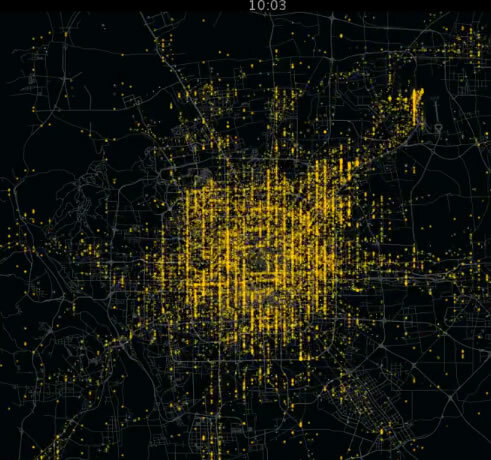 Pictured right: Data of taxi traffic patterns in Beijing, China. Yellow dots are taxis, and grey lines are the major roads in the city. Because of the fast development of the information and communication technologies, the transportation sector is on the edge of some significant changes. Understanding the environmental impacts of these emerging systems can help guide policy decisions, inform system deployment, and avoid unintended consequences. Dr. Cai is also interested in integrating human behaviors at the individual level into environmental assessments. Her group is working on collecting shopping behavior data to identify means that can promote sustainable consumption. Assistant Professor John Howarter and his research group recently published work on lignin-based 'green' flame retardants for epoxy and polymer materials. This work is significant because flame retardancy was achieved while avoiding the use of halogen additives such as bromine, incorporating a biologically derived industrial byproduct. Lignin is a key component of trees and all plant materials, and is a byproduct of the paper industry. The group’s research article, “Phosphorylated lignin as a halogen-free flame retardant additive for epoxy composites,” was published in the journal Green Materials with graduate students Gamini Mendis (pictured left) and Matthew Korey, and Environmental and Ecological Engineering undergraduate student Sydney Weiss, along with coauthors from the U.S. Forest Service and EEE affiliate faculty Jeff Youngblood. Dr. Howarter (pictured right) was elected to the Board of Directors of The Metal, Mineral, and Materials Society (TMS). He will serve as the incoming chair of the Public and Government Affairs Committee of TMS and is a co-editor/co-organizer of the symposium "Deriving Value from Challenging Waste Materials: Recycling and Sustainability Joint Session" at the TMS 2017 Annual Meeting in February 2017. 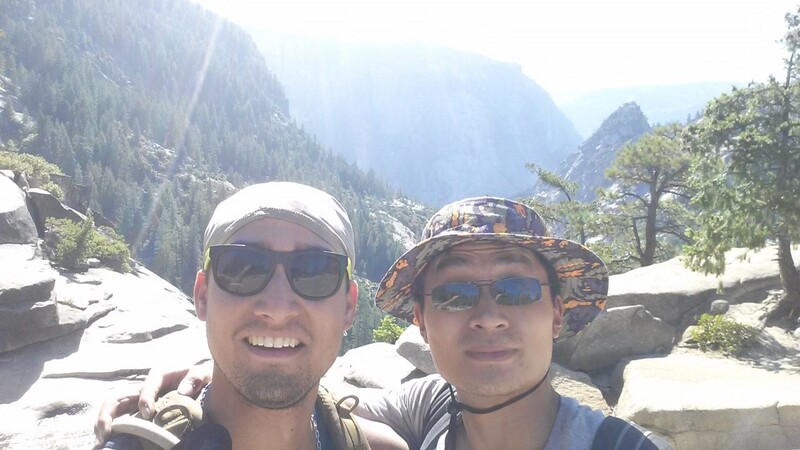 Purdue graduate students (pictured left) Kai Gao (left) and Logan Kearney (right) are moving forward with advances in stimuli-responsive membrane technology. 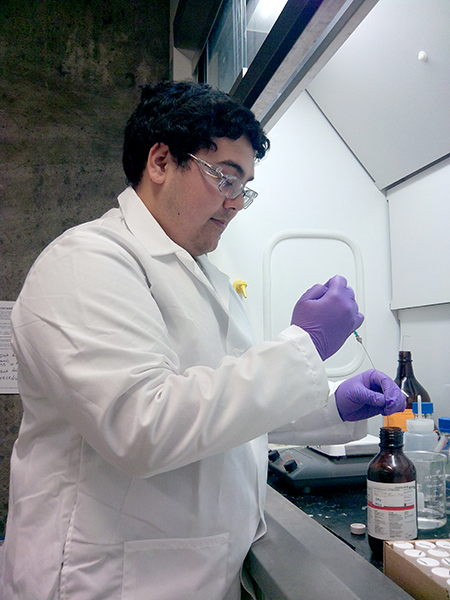 Dr. John Howarter’s group has been examining surface functionalization of polymer membranes able to target specific ionic contaminates. The functionalized membranes have selective transport properties based on the pH of the water solution. This functionality allows the membrane pores to open and close thereby selectively blocking salts or small molecule contaminates from passing through the membrane at neutral or high pH. The group’s research article, “Enhanced Wettability and Transport Control of Ultrafiltration and Reverse Osmosis Membranes with Grafted Polyelectrolytes,” was published in Journal of Applied Materials & Interfaces.